“Honored in a classic calypso tune, this ubiquitous Caribbean stew came to the islands in the seventeenth century from Africa. According to the song, the spicy dish of stewed greens has the power to induce any man who eats it to propose to the woman who prepared it. Small wonder its appeal has been so enduring. 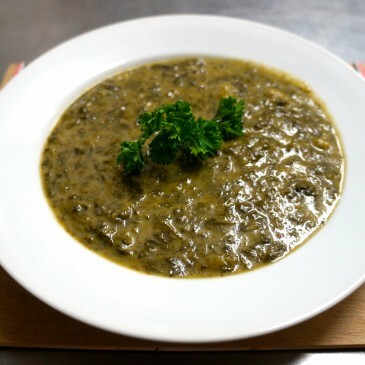 On the ground, callaloo is also often used as the name of the plants whose leaves provide the base for the dish; these differ from region to region, but are most often either of the spinach-like taro or amaranth variety. Cooked, they have a bright emerald color, a pleasingly silky texture, and a warm, sunny flavor reminiscent of collard greens, though more complex.